Nice, quiet apartment living. High quality apartments. Gated community so I always feel safe. Only complaint is that maintenance requests often fall through the cracks or are not processed in a timely manner. Thank you for giving us your feedback! We certainly want to make your experience here at Vista Commons exceptional. Please reach out to the office regarding any concerns with your apartment for we value your residency and want to make sure we rectify any maintenance issues you have so we can earn a 5 star review in the future. Best apartment experience so far. The staff are always quick to respond and easy to work with. Everything is clean and we love the trash concierge service. Thank you for leaving us a review! Please let us know if we can be of any assistance with your new home and thank you for choosing to call Vista Commons HOME! Thank you for leaving a review. We certainly want to make your living experience here at Vista Commons exceptional. Please contact the office with your concerns regarding office staff and any misinformation you may have been given. We would love the opportunity to address these concerns. Overall great and a safe place to live in. The locating is very convenient and close to USC. The staff is nice and helpful. The outdoor trash is quite far so if the could do something about it to facilitate the process of walking all the way to the outdoor trash would be very convenient. I really enjoy living here! It is safe, quiet, and everyone is so friendly! The pool and outdoor area is great for relaxing and spending time with friends. Vista Commons is a wonderful place to live. As an out-of-state company renting apartments for a project in SC, this has been the best experience. The office is responsive to questions, helpful, and our employees love the apartments. Vista Commons is located in the perfect spot in Columbia. It’s on the same street as Columbia Craft brewing and only a few steps away from the vista with soo many food, drink, and entertainment options. Staff has been very friendly and helpful. Apartment is modern and was clean when we moved in and very spacious. Wish the fitness center was bigger but other than that the amenities are great. My roommates and I have only lived here for a few months, and so far the apartment is wonderful. Maintenance has been a little slow, but I believe they're a little backed up. I love living at Vista Commons, in the heart of the Vista. I am in the heart of SC’s thriving capital city, yet I have the comfort and camaradarie of small town living. The staff here does everything possible to accommodate my needs and make me feel at home. Location, location, location - can walk everywhere in town from this location. Conveniently located to access the Cayce and Granby RIverwalks. Recent apartment renovations with new cabinetry, granite countertops, bedroom ceiling fan and flooring have freshened up the floorplans. There is ample parking for the residents. For the 1 1/2 years that we have been here the community is quiet with mainly grad students and working adults. The pool and outdoor kitchens are a plus but the business center is small and there is no place where a resident can host a small gathering. But you cannot beat the location of this complex. Vista Commons is the best! Great staff and maintenance. Safe, clean, and fun place to live. Love the grilling and pool area-it’s a great place to meet other residents. So far so good. Maintenance was quick to fix a problem. The apartment is updated and comfortable. Wel look forward to using the pool area a d other amenities. Thank you for leaving a positive review! We are glad you chose Vista Commons to call home! Please let us know if we can be of any assistance with your new home. The apartments and amenities are awesome. The maintenance crew is great. The office staff leaves something to be desired. The perpetual turnover has untrained personnel giving incorrect information. Thank you for your review. I am sorry to hear your dissatisfaction with the turn over in office personnel. We strive to meet service excellence in all categories including training new employees. I would like to discuss your recent experience with the office staff. Please stop by or call the office at your convenience. Sincerely, Management. Just moved in. Love it so far! I met neighbors in the first day that were extremely accommodating. All of the facilities are nice and the office has been very responsive. Great overall. I have not officially moved in yet, but so far the office staff has been excellent in answering my questions and trying to make my move as convenient as possible. It’s really great. The community is extremely safe and clean. But it is disappointing that rent increased $200/month in only one year. Also have a few issues with solving maintenance problems. Thank you for your review! We would like to resolve your maintenance issues. Please reach out to a member of the office staff so that we may assist. Thank you! Thank you Stephen for your positive review. We are glad you chose to call Vista Commons home. Please let us know if there is anything we can assist with in your apartment. I love my apartment and location but wish we did more activities as a community to help meet the neighbors. I hardly know anyone else who lives here so that's my only complaint! Thank you Justine for the positive review. We are glad you chose to call Vista Commons home! We are currently planning an oyster roast in April and look forward to seeing you there. Hi Elizabeth, thank you for your positive review. 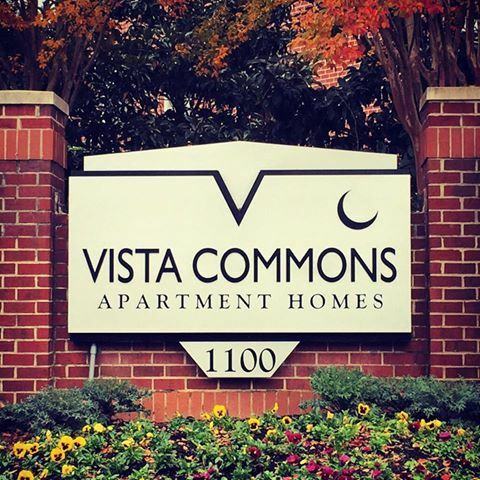 We are glad you chose to call Vista Commons home! Please let us know if we can be of any assistance with your apartment. Excellent front office staff and maintenance crew - always helpful. The grounds are well kept and clean. Small downside - front gate is frequently out of sorts. Hi Alex, thank you for the positive review! Just last week we replaced the front entrance call box along with other components to the gate and hope this will assist with the frequent electrical malfunctions. Please let us know if there is anything we can assist you with in your apartment home and thank you for choosing Vista Commons! Living at Vista Commons is great. There are so many great amenities and the location is prime for the Vista. The staff here are so helpful and friendly all the time. I wouldn't want to live anywhere else! Hi Erin, thank you for the positive review. Please let us know if there is anything we can assist with in your apartment home and thank you for choosing Vista Commons as your home!